There are numerous applications for quantitative polymerase chain reaction in the laboratory. It is commonly used for both diagnostic and basic research. 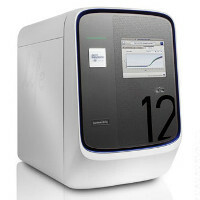 Uses of the technique in industry include the quantification of microbial load in foods or on vegetable matter, the detection of GMOs (Genetically modified organisms) and the quantification and genotyping of human viral pathogens. PCR can be used to quantify nucleic acids by two common methods: relative quantification and absolute quantification. Absolute quantification gives the exact number of target DNA molecules by comparison with DNA standards using a calibration curve. It is therefore essential that the PCR of the sample and the standard have the same amplification efficiency. Relative quantification is based on internal reference genes to determine fold-differences in expression of the target gene. The quantification is expressed as the change in expression levels of mRNA interpreted as complementary DNA (cDNA, generated by reverse transcription of mRNA). Relative quantification is easier to carry out as it does not require a calibration curve as the amount of the studied gene is compared to the amount of a control reference gene. We have access to high-throughput qPCR equipment and have validated 100s of probes, TaqMan Arrays and qPCR panels.